SeaWorld Was Originally Intended To Be A? Which Of These Animals Is Associated With Halloween Because Romans Believed Witches Shape-Shifted Into Them? SeaWorld is the world’s best known chain of marine mammal parks, located in Orlando, San Diego, and San Antonio, featuring thrill rides, exhibits and educational displays and, most notably, elaborate and live entertainment provided by regularly scheduled dolphin, orca, and sea lion shows. What’s curious about what is arguably the home of the greatest marine shows on Earth is that it wasn’t originally conceived as a massive amusement park focused on animal exhibits and showmanship at all. The four UCLA graduates, Milton Shedd, Ken Norris, David Demott, and George Millay, who originally brainstormed the idea of SeaWorld (and eventually opened the first SeaWorld together in 1964) wanted a restaurant. A really, really, cool restaurant at that. The original plan was to create an elaborate and completely underwater restaurant where diners would feel like they were dining under the sea and be treated to marine life shows. When it proved entirely unfeasible to build what amounted to a giant over-engineered bubble under millions upon millions of gallons of water, the four of them turned their sights toward a more reasonable goal of opening a marine-themed park. 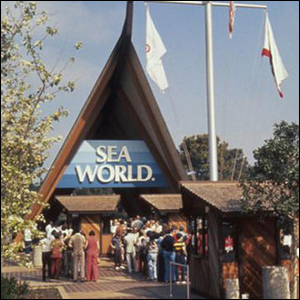 Despite the modest size of the first SeaWorld location in San Diego, it drew nearly half a million visitors in the first year and they branched out from there.